Thank you so much for your help this past month, for your financial support, your prayers, your cards and notes of cheer, and for the many goodies and packages of things that we could never afford to buy in this frontier outpost. We begin this year with a prayer for you and everyone you love. May your generosity be greatly rewarded. 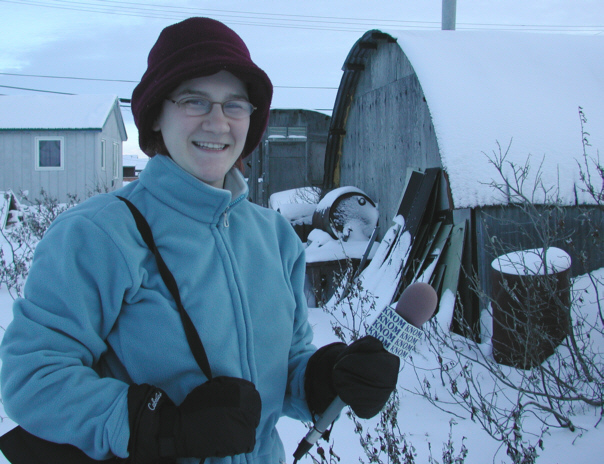 ON THE MOVE: (left) You’ll often find KNOM volunteer news reporter Julia Dunlap en route to cover a story or a meeting, tape recorder in hand. One of Julia’s beats is the Nome School Board. 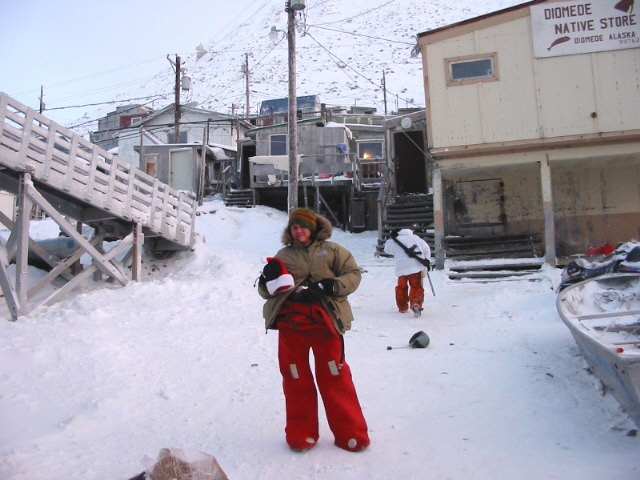 Recently, from St. Lawrence Island, she reported on two villages’ painful struggle with “persistent organic pollutants” left by the U.S. Army. RECEIPTS: On January 14th, we mailed a receipt to every contributor who gave $250 or more during the year 2002. We believe all are accurate. If you think we’ve made an error, please contact us immediately. If you’d like a receipt, please let us know. We’re happy to provide them regardless of amount. COUPONS AND CREDIT CARDS: Last month we added a coupon to our newsletter, as well as the option of contributing by credit card. Both were at the request of many of our donors. Response has been generally favorable to these small changes. One thing that happily surprised us is the number of our friends who wish to contribute automatically every month by credit card. (However you choose to give, we will continue to acknowledge each gift with a letter.) Thank you! KNOM is the oldest Catholic radio station in the United States -- thanks to you. INSPIRATIONAL SPOT: As Christians, we have the light of Christ within us. Jesus reminds us that it is not enough to have this light. We must shine it. top Little Diomede (left, photo by Amy Flaherty) is a tiny Catholic village of rocky slopes and harsh storms located on an island in the Bering Strait, just 2-1/2 miles from the island of Big Diomede, Russia. On October 29, 2002, KNOM volunteer Julia Dunlap accompanied U.S. Senator Ted Stevens on an overnight journey to this most isolated village of 146 souls. You would have to be an elf to get closer to the phenomenon of Santa Claus. 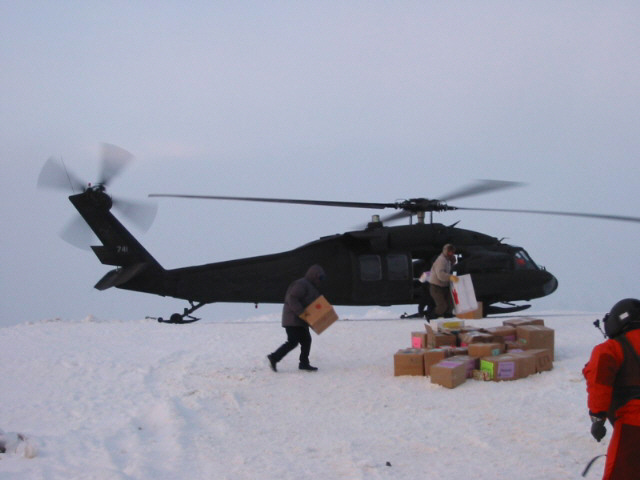 For years, the Alaska Army National Guard has delivered presents to remote village children, and KNOM news director Paul Korchin and I were invited to the most remote point on Santa’s list. I never thought we’d make it. 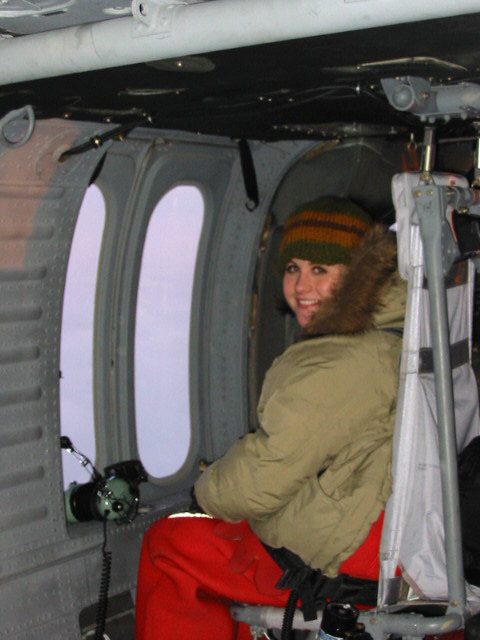 The week before Christmas, we took off from Nome in the National Guard’s Blackhawk helicopter, but violent winds forced us back to safety. Bad weather continued, and the mercy flight was canceled day after day. Finally, Christmas Eve, the weather wasn’t much better, but the Guard decided to try for it. Paul and I suited up. We crawled feet first into protective outfits known as “Gumbi suits,” stuck in ear plugs and secured our bundled bodies into the chopper (left). I sat with a Christmas tree at my feet next to Santa, who preened his suit as we flew. We quickly ascended to 6,500 feet, above the clouds, our pilot hoping for an opening. As luck would have it, a break appeared. Ice floes came into view, and then a snow-covered mountain jutting from the gray sea. Little Diomede! The village itself is on a small patch of the island by the ocean, the only area that’s not almost-vertical cliffs. As we banked around the island for landing, we could see Diomeders running from their homes toward the town’s helicopter pad. Paul estimated that the wind chill was eighty below zero. 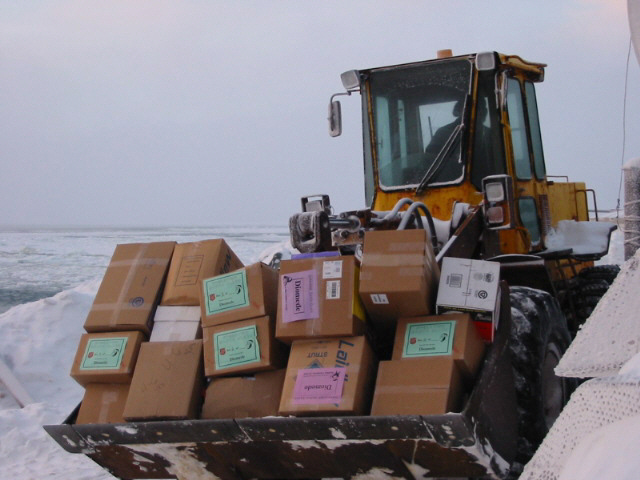 (Left) It was only a few moments before all of the presents were loaded into a forklift and headed for the safety of the village school. In the photo, you can see a bit of the Bering Strait ice. You’re looking toward Russia, but the nearby island of Big Diomede is shrouded by clouds and fog. Big Diomede is across the International Date Line. Since we couldn’t see it, I guess you could say that we only looked halfway into tomorrow. One image that will remain with me was the sight of two young girls. The pair pressed expectant faces and hands to the front window of their small plywood home, sneaking peeks at Santa Claus. Below their front window hung the hide of a polar bear, a reminder to me that the hardy people of this village live close to the land, feeding their families with fish, crab and locally hunted seals, polar bears and whales. I reached around to take a picture of the children, but they were gone, probably off to the school to claim toys or new clothes from Santa’s visit. We were losing the winter’s brief daylight, and the weather remained a concern, so the Guard crew hustled us back onto the helicopter. (Left) In our final minutes there, Paul snapped this picture. Behind me, you can see the village, and the steep mountain behind it. With our pilot extremely eager to take off for home, there was a problem: Santa Claus was missing! It turned out that the village children were so excited to see the old elf that they kept insisting he stay at the school. It took a very determined Guardsman to pry Santa away from the schoolchildren and back into the chopper! En route home, we wore headsets to listen to and talk with the Guard crew. It was a rewarding trip for them. Operation Santa Claus brightens not only its beneficiaries, but also its givers. For me, it was an incredible opportunity to visit some of KNOM’s most remote listeners. INSPIRATIONAL SPOT: Shared joy is doubled joy. Shared sorrow is half-sorrow. 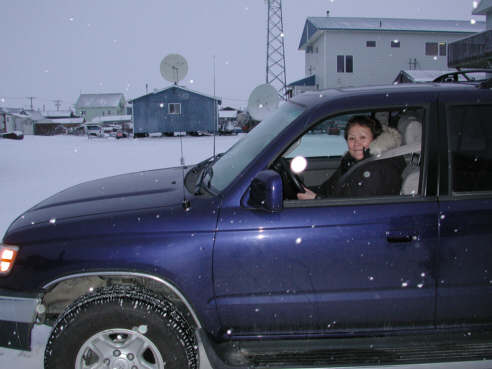 top “WHEEL DONE:” (left) With light snow falling, KNOM business manager Florence Busch drives the mission’s 2002 Toyota 4Runner to the Nome post office. We sincerely thank everyone who contributed toward this new vehicle. It replaces a 1990 4Runner. Sale of the old truck paid for one-third the cost of the new one, which we expect will serve as the mission’s only vehicle for the next twelve years. HALF-BAKED: Nome chefs who wanted to make special cookies and icings were out of luck. The week before Christmas, Nome ran out of Maraschino cherries. FREEZE! October, November and December were the warmest on record, averaging +25°. Things cooled off the first week of January. Then, on January 7-8, the mercury rose from -27° to +28°, a sudden increase of 55 degrees! OFF THE HOOK: That was KNOM’s telephone all day December 20th, as we broadcast telephoned Christmas greetings from over four hundred listeners. Manager Tom Busch found himself winded at the end of the seven-hour program. APPLY TOPICALLY: Discussions on KNOM during December included the subjects of arctic pollution, drunk driving, caribou management, suicide prevention and many more, thanks to you. Once again, thank you for keeping us on the air. We bring daily Rosary, the Mass, about 3,000 inspirational and 3,000 educational spots each month, timely news coverage, conversation and debate on the many problems which face our far-flung village listeners , information, entertainment and positive companionship. We invite you to learn more about us on our web site, www.knom.org, or to write us with questions or comments any time. We pray that God will bless you greatly for your generosity. Copyright 2003 KNOM. All rights reserved.